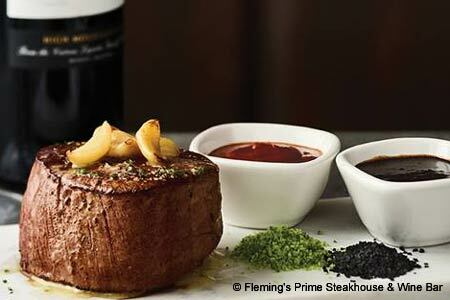 This steakhouse distinguishes itself with its top-quality meats and notable wine program. : Founded by restaurateur Paul Fleming --- the original P.F. in P.F. Chang's --- and William Allen, III, this steakhouse chain distinguishes itself with its top-quality meats and notable wine program. The pretty restaurant, with a wood-trimmed clubbiness that’s softened by burgundy fabrics and amber lighting, lacks the testosterone-amped atmosphere of other high-end steakhouses. The menu, which specializes in corn-fed beef (aged for up to 28 days and hand-cut on the premises), also features almond cilantro-crusted shrimp, seared curry scallops and poppy seed- and pepper-encrusted ahi loin, anointed with tomato vinaigrette. Of course, if you're there for the Prime steaks, you won't be disappointed. Broiled at 1,600 degrees, they're properly charred on the outside and juicy within. Fist-thick veal chop, lamb chops, prime rib and beef Flemington (think Wellington) offer other meaty possibilities. À la carte sides generous enough to share include creamed corn, onion rings, chipotle cheddar mac ‘n’ cheese and spuds of every description. Finish with a classic dessert: walnut turtle pie, carrot cake or crème brûlée. The mainstream wine list roams the world, with all 100 selections available by the bottle or glass. In addition, there's an 80-bottle reserve list.